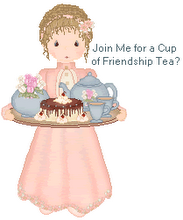 a topic of discussion on the Afternoon Tea Across America Facebook Group today. given to me by Aunt Ida several years before she passed away. It was one of her "treasures" found on antiquing journeys with her friends. The set has 4 cups and saucers and all are marked RS Prussia. "While the maid did the house work, the ladies were looking for something to do." Aunt Ida had a great sense of humor and a gusto laugh. pot featured in the article. "Bored Housewife Probably Painted pot in 1906." I don't think Aunt Ida was "bored" a day in her life!